Happy Halloween everyone and a good holiday or festival for those who celebrate something else! Today we move one step close to our second series of Libris Monstrum with another revisited entry for series one. This time we return to the furry little familiar, the rat. I love rats because they are just so commonplace in RPGs and how can they not be? Any setting where there is some amount of global travel includes rat populations being spread all over. Whether in the town gutter, the warehouse of a shipping company, or the bowels of a space station rats are here to stay! One simple way to use rats at the game table is to ignore them as a combat threat. At least, ignore that as a basis for getting them into the game. Instead focus on all the things rats have been responsible for (at least partially so) throughout our history. These things eat virtually anything, are hearty enough to survive everywhere except Antarctica, and reproduce a amazing speed. While the individual rat is, itself, not a dirty animal these creatures do inhabit places that harbor things that humans would rather not come anywhere near: mold, sewage, trash, and the like. As a result it is not difficult for a rat to be exposed to different diseases and are, in fact, a vector for many terrible ones. Most noted among these is, of course, bubonic plague that was transmitted through fleas that went from rat to rat to cat and dog to human. What makes them dangerous is their conjunction with humans and their larger numbers in areas and times where humans are most likely to be victims of disease. The two aspects feed off each other until there are plague conditions. Such an event could occur in your world and it could be any kind of disease, but the point is rats aren’t the true problem they just represent an aspect of it. One that is easily blamed, at that. There are other ways to utilize the rat as well. Some of these are good and rats pop up as both positive and negative creatures in various mythologies. The negative tropes about rats are fairly obvious. They represent filth and disease. They carry with them sickness and death. Those cultures that don’t immediately look at the rat in such a way recognize the rat for what it is. The generosity, intelligence, and creativity of the rat are seen and attributed. Of course plague isn’t the only thing that sets the rat away from these qualities. In India, there is a bamboo that flowers in a vast area all at once. When this happens the plants drop seeds and then die. The result is a windfall for the rats who eat the seeds and a resultant boom in population. Called a rat flood, this results in granaries and other food sites to be raided by the incredible number of rats and a famine situation occurs for the affected areas. I can only imagine the problems following the death of so many rats as well. Such dire events might make for an interesting occurrence within a D&D campaign. These have to be one of my favorite creatures in Dungeons & Dragons, despite being one of the silliest and most pointless. These creatures are a bit larger than your average rodent but that isn’t what makes them special. Appearing in the 3rd Edition Monster Manual II, these guys were rats that changed with the moon. The fuller the moon became the more intelligent and powerful they became. Of course the moonrat’s abilities would wane with the passing of the full moon until they are no more than normal rats. What really gets me about these creatures is the art for the entry. That rat just sitting on a barrel shouting orders to its fellows under the full moon and what is clearly a well written plan on parchment in his paw. It is too good. These guys would make a perfect adventure or one shot as the full moon approaches weird things happen until all hell breaks loose! Then things quiet down and confusion, as much as anything else, will reign as the town tries to figure out what happened. Had trouble finding artist to credit, from MM2, will update if found! Okay so to start this last section I need to thank the person who pointed me towards the rylkar, because I never would have thought of them and after reading some more I love them. Sadly I cannot find the post on Twitter to properly thank them. If it was you let me know so I can! 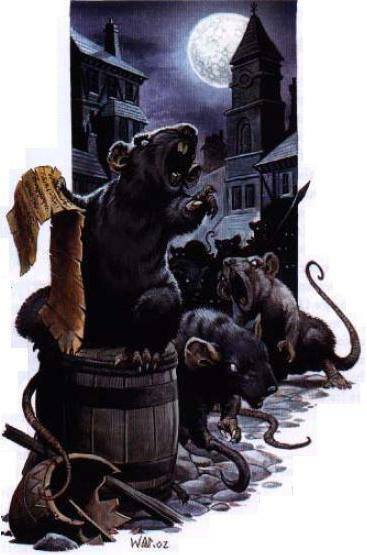 So the rylkar appeared in the Monster Manual V for 3rd Edition and bring the rats back to their disease-ridden roots. These monstrosity comes from the Underdark and are really just…rat-adjacent. The beasts feed on garbage and detritus, but more than that their mere presence spreads a taint of rot and corruption. Being in a place makes more food for them. However, reproduction is a bit crazy as it requires open flame. See, the harridan or queen of the rats (did I mention they are a dark hivemind?!) is not resistant to fire but releases swarms of young rylkar when damaged by it. It is the worst case scenario for someone who would, as movies suggest, rid such an affliction with copious amounts of fire. There is so much about these creatures that would be surprising to an adventurer who might find them to just be a strange species of rat in the endless requests of bar owners who have rat problems.